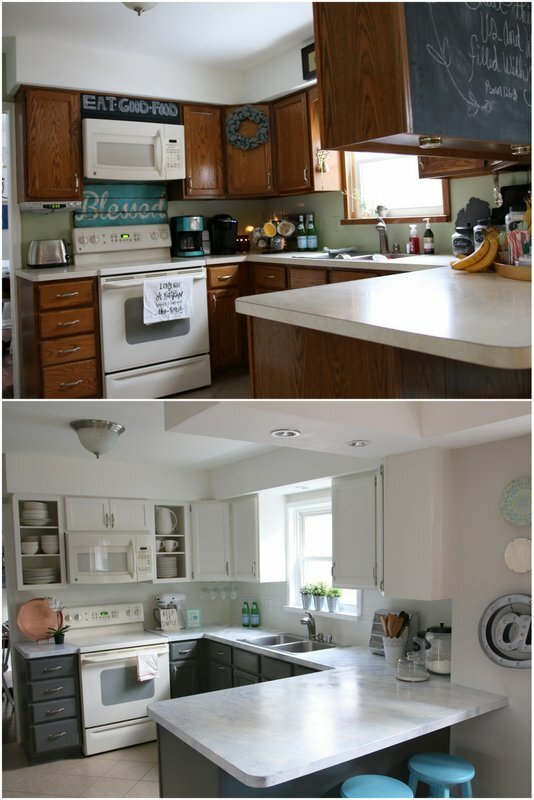 Home » Blog » My Fixer Upper Inspired Kitchen Reveal! 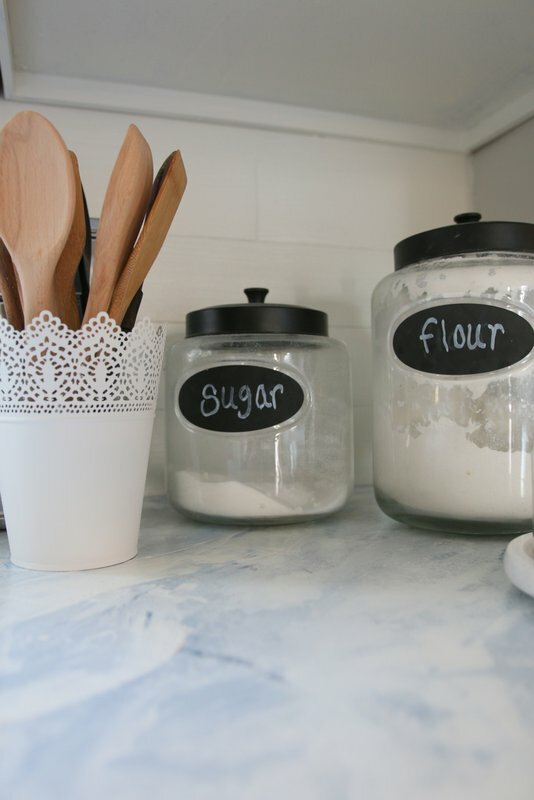 My Fixer Upper Inspired Kitchen Reveal! 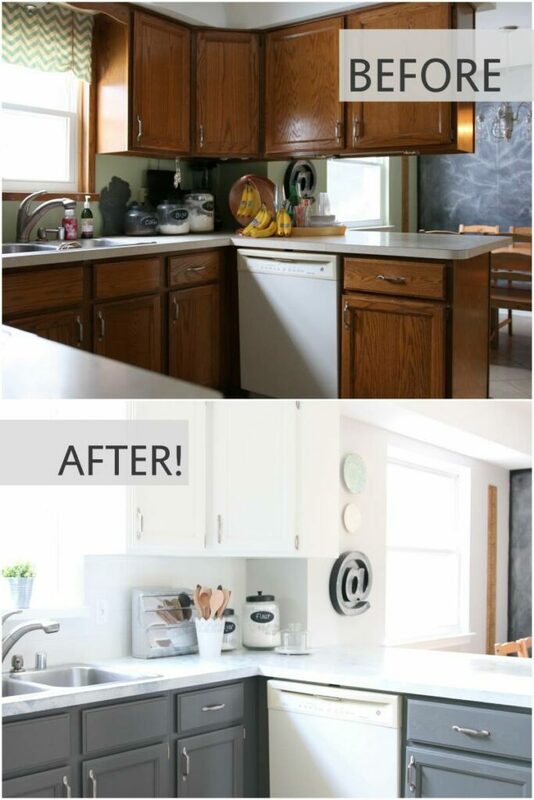 I am SO excited to finally share the before and after shots of my Fixer Upper inspired kitchen redo!! I’ve been channeling my inner Joanna Gaines, tearing down walls and installing shiplap like mad. Can you say “major improvement??! 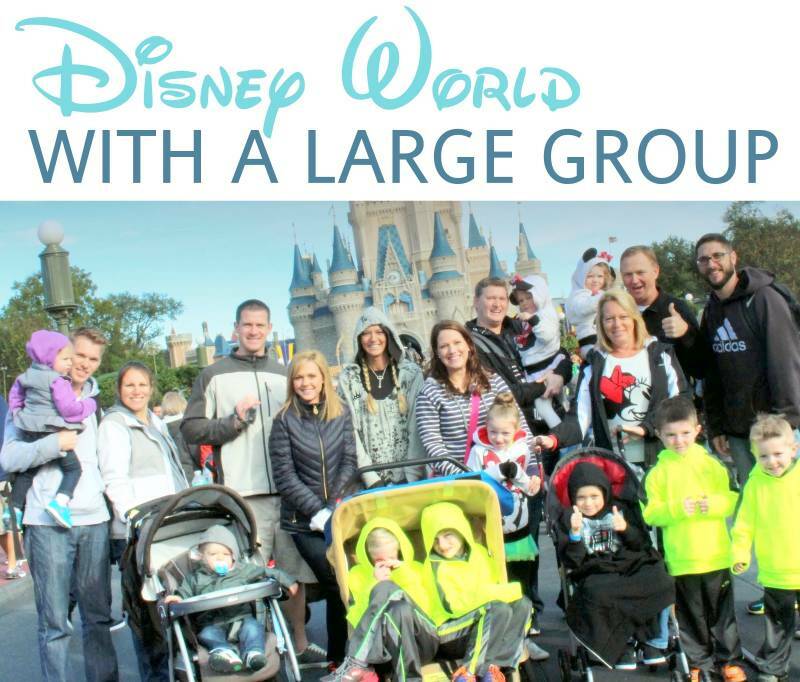 !” Can you believe the contrast from dark and dreary to light and bright? I am just smitten. I did all this for about $300!!! I have been anxious to start on this project for years. I’ve dreamed and planned and pinterested up a storm. Now, after 2 weeks of non-stop painting, sanding, and faux marbling – I am ready to take a painting hiatus for a couple years! 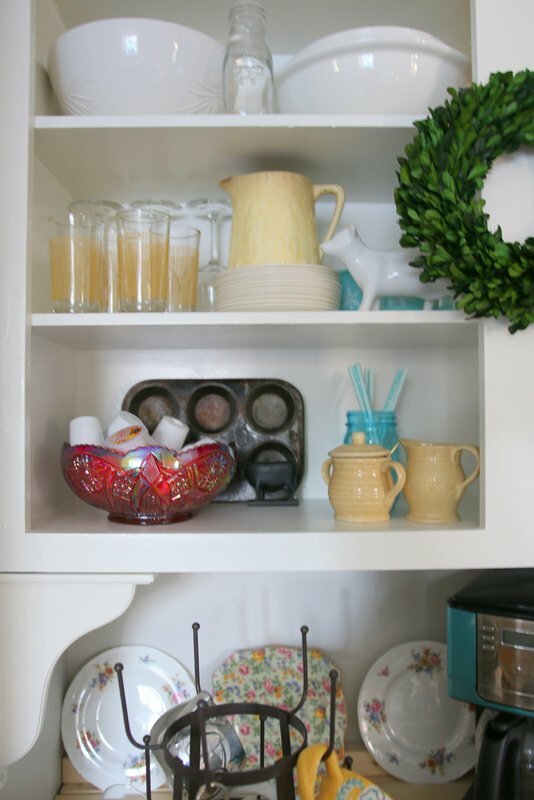 Clean and organized, decluttered and downsized!! 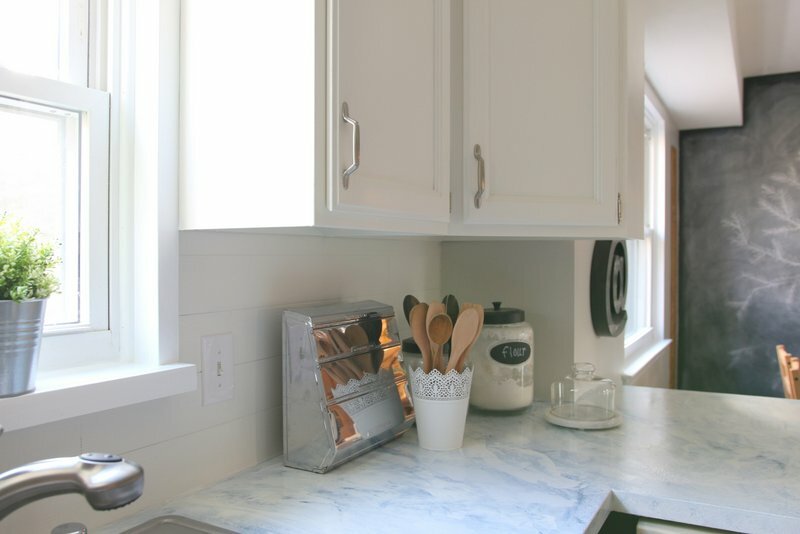 I was able to add a little shiplap into my life for about $20 and I really wanted to use SUBWAY TILE somewhere. 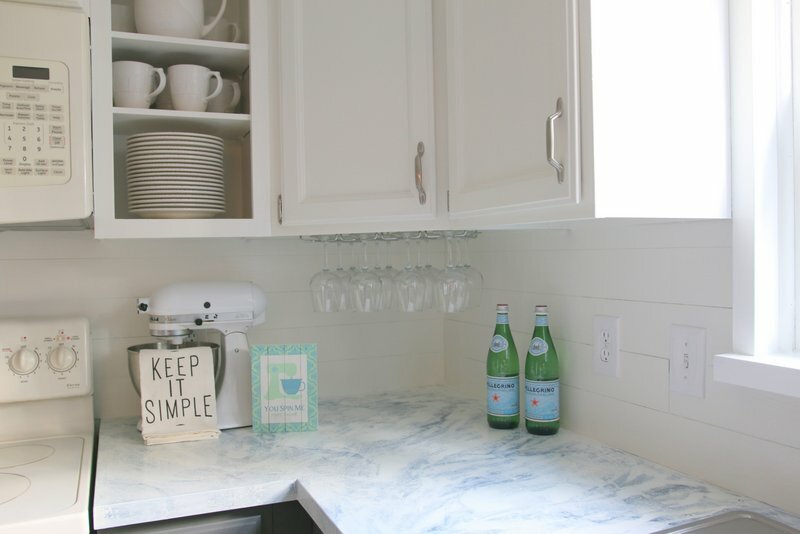 Having purchased metal peel and stick subway tile from Menards, I was prepared to use them on my coffee bar area when I decided it just wasn’t worth it. 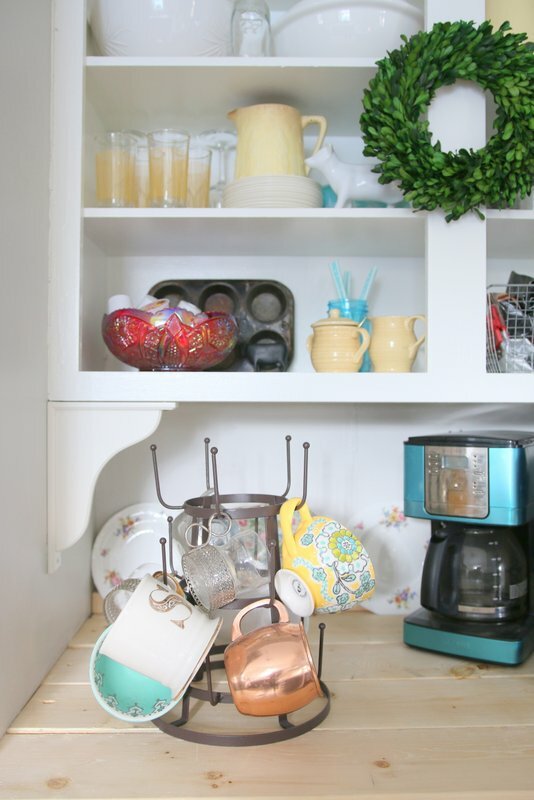 I couldn’t justify the price for a spot that was almost completely covered by coffee pots! I’m so excited about this coffee bar area! The base cabinet was $20 from the Habitat for Humanity ReStore, the upper was repurposed from another part of the kitchen. I used 4×6 planks to create a faux butchers block counter. THIS IS NOT DONE! It’s one major thing I have yet to finish. It still needs to be sealed and polyurethaned. But it was close enough to take a few pictures! 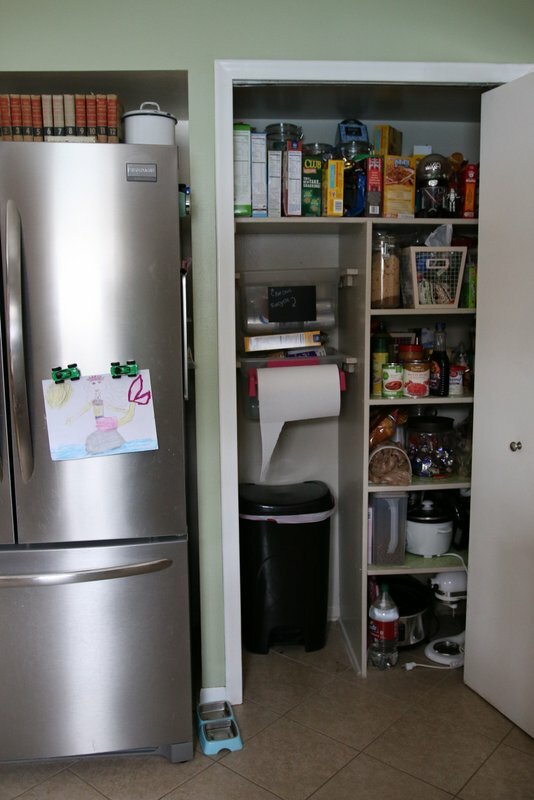 Here’s a BEFORE of the Pantry!! Thanks for stopping by to tour my new kitchen! 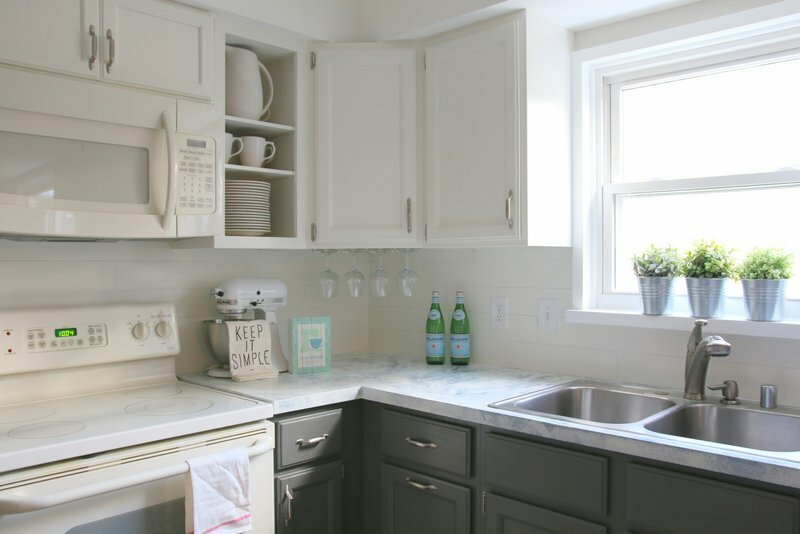 countertop painting, all the details on cabinets and more!! 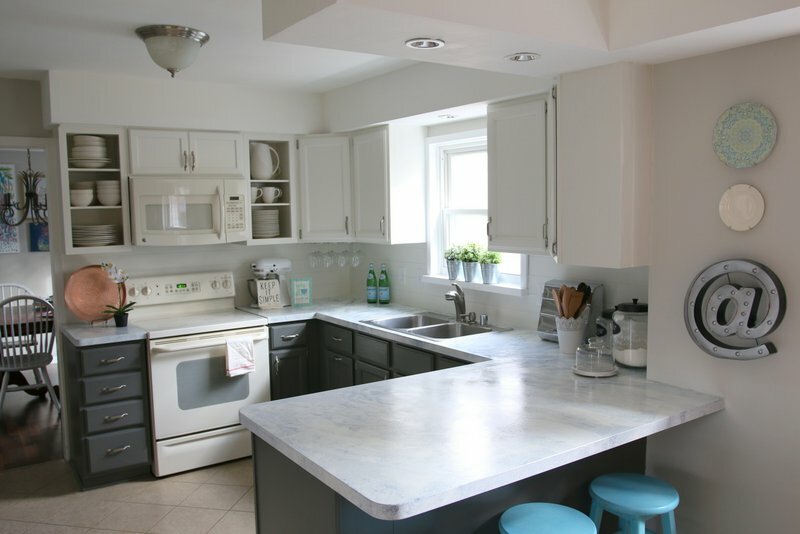 I’ve been looking for ideas to up date my kitchen (for the 5th time) for a while now. Even if money was no object(which it is), I would not invest it in this house. Ever see the movie Money Pit? That’s what my husband and I purchased 30 years ago and have been living in every since. We’ve sunk large sums of money just to keep this house standing. Have had to have a new foundation twice and the cracks are returning. Don’t even get me started on the pool and black mold. 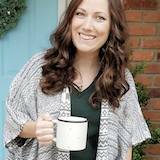 But my kitchen needs a face lift so I’ve spent the past 6 months on google, looking for something I like but wouldn’t break the bank. 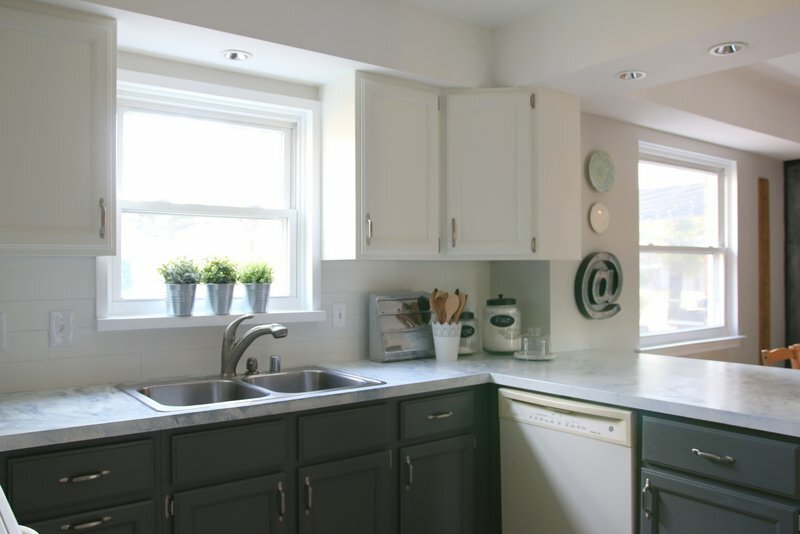 All I have decided on was white and grey cabinets. Then today I came upon your fixer upper and saw my exact kitchen in your before pictures. Same layout, ugly cabinets included. I even have a Giani counter top kit I purchased and have just been staring at, too scared to put it on. But you my friend have given me some needed inspiration. 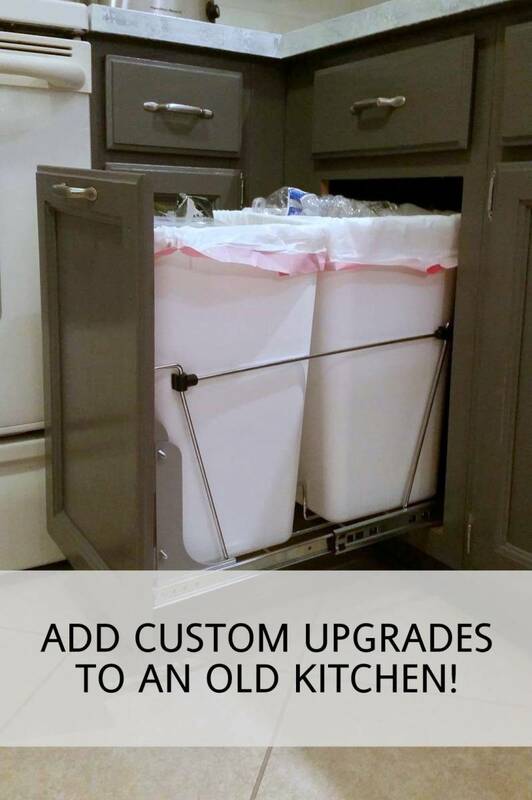 Of all the sites I’ve been to with “How to remodel your .kitchen on a budget”, and there are thousands out there, you have hit a home run. Really, you are my new hero. 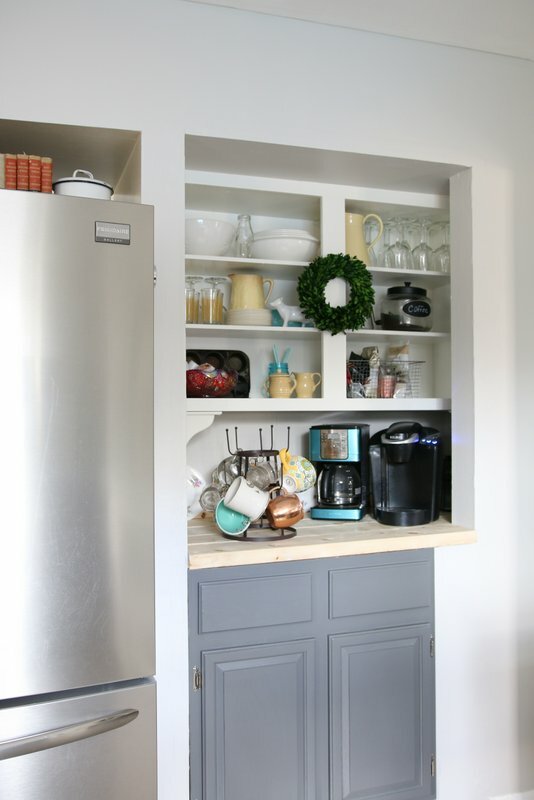 What a genius idea removing your pantry door and upper cabinets to create such a cute space. And as I mentioned before, since my layout is the same, it actually seems quite doable. I love everything about your new fixer upper including the price tag. So I just want to say thank you for giving this old gal some hope and I look forward to seeing what else you have up your sleeve!! I love a good fixer upper. Wow. 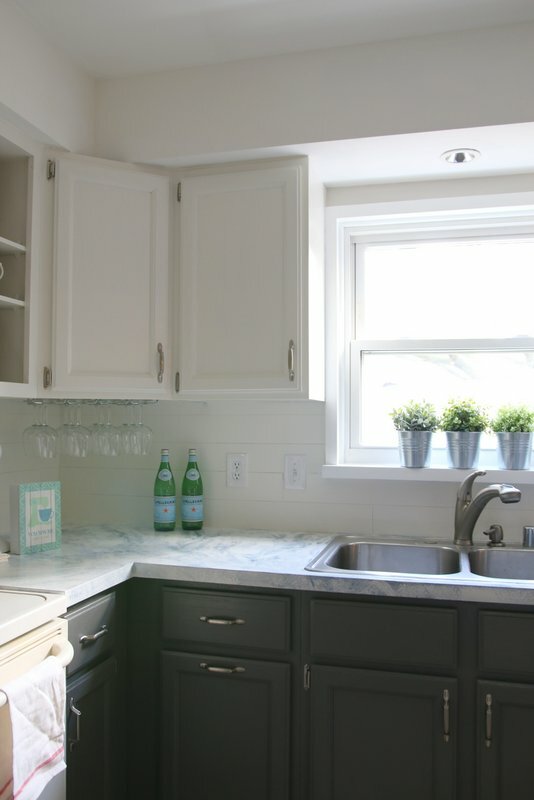 I am thoroughly impressed in your kitchen rejuvenation. You did an outstanding job and it goes to show you what can be done with a small budget and some great ideas. A little paint can sure go a long way! Thanks so much for sharing. Hi! 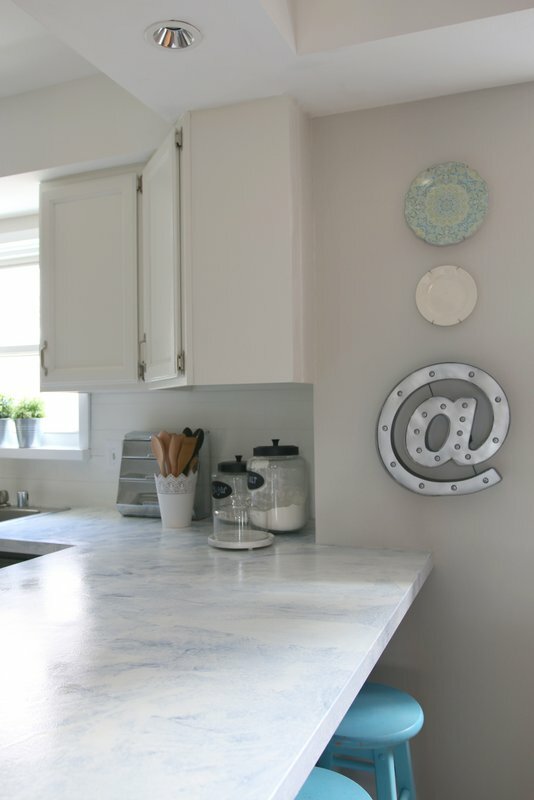 I’m thinking of attempting this project in my kitchen! Love the idea and just so happen to have a couple of boxes of peel and stick planks leftover from a previous project. I was wondering what you did at the end of wall? Did you add a molding? Just paint edges white? I have a couple spots that will be “open ends”. Thanks so much & I love your kitchen! Off topic—I see you have the Frigidaire Gallery fridge—- Do you love it?? 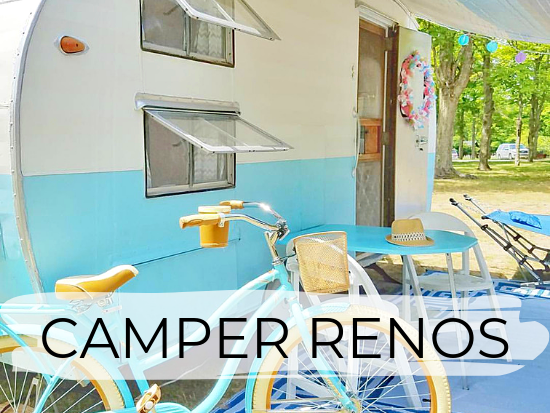 I am looking at purchasing here shortly and am so anxious about making the final decision!! That is incredible! You did a great job! It looks so big and bright and open! Fabulous! 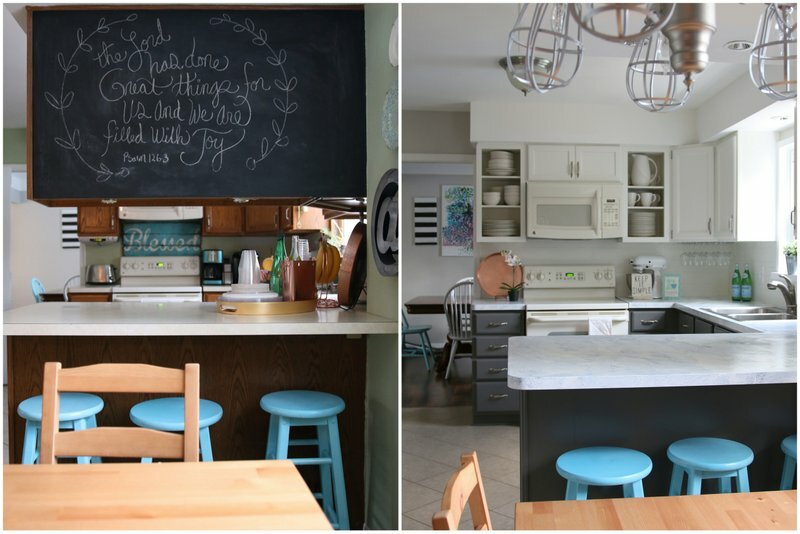 This is the first time I have seen a kitchen that looks almost like mine that has been updated so well. I have searched Pinterest and everywhere else to find ideas and this is the very best fit. Thanks for posting. Hi!! I ABSOLUTELY love this and talk about timing!! I have a piece of peel and stick on my craft table right now painted with chalk paint and waiting for its final coat of some type of washable matte finish..What type of paint did you use on your faux shiplap? Does it wipe well? Would LOVE and APPRECIATE any all feedback and personal opinion!! What a beautiful transformation! 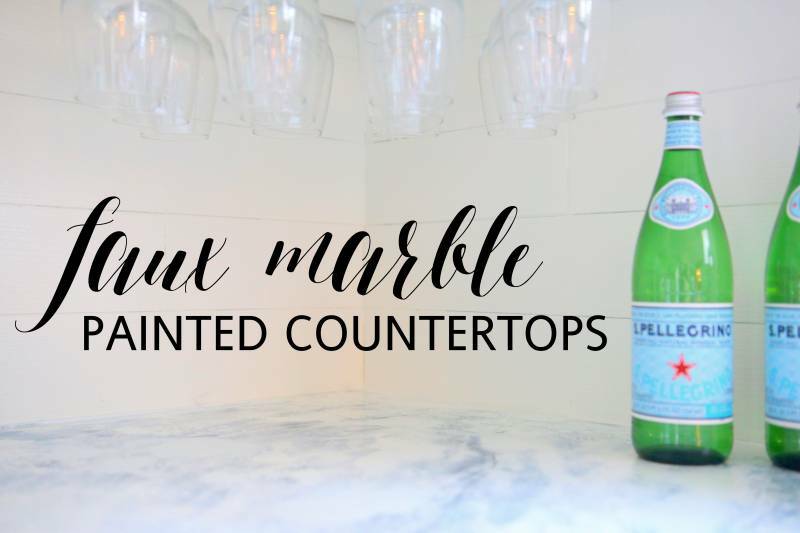 I am planning on painting my countertops to faux marble as well. Curious what made you decide to go with the gianni over an epoxy? Love how it turned out! Wow, this is really beautiful! 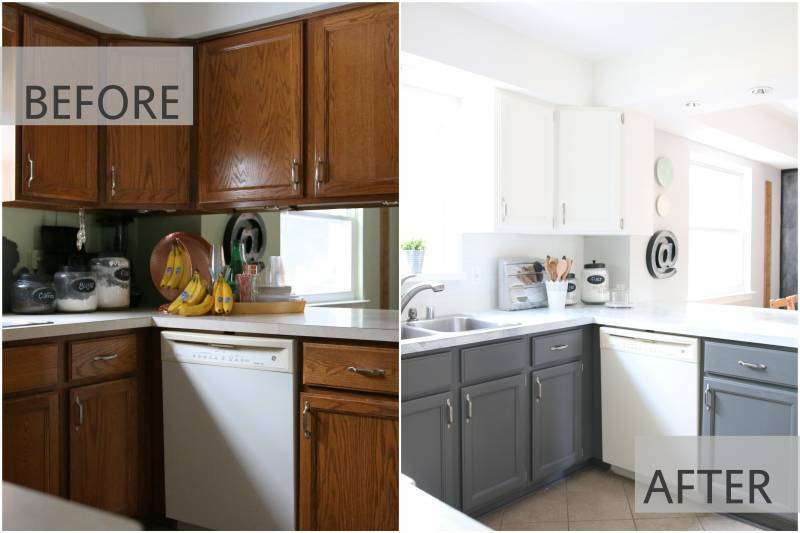 Your kitchen is the same layout as mine and your choice of dark base cabinets and light upper cabinets is exactly how I’m planning to paint my kitchen this spring! Shut up!! Peel and stick vinyl for the shiplap? Oh my. 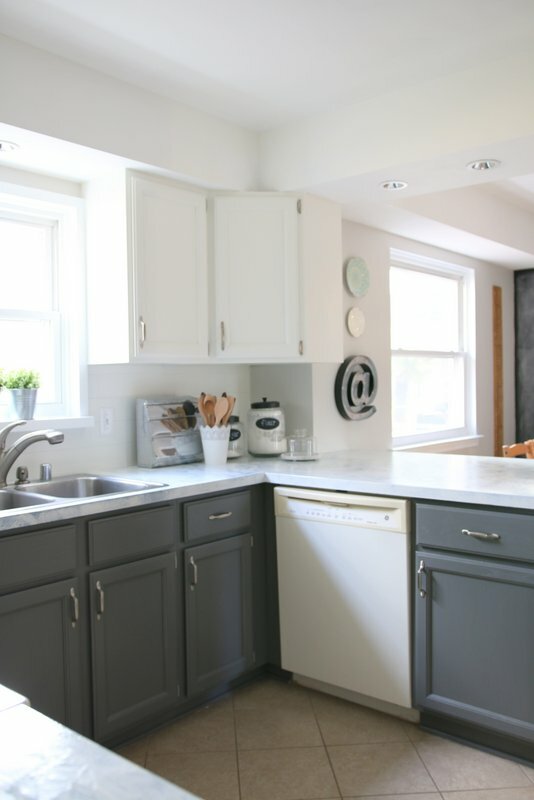 You just don’t know how perfect the timing is on this post…I am planning my kitchen upgrade and was wanting to paint lower cabinets a darker color and use planking or beadboard on the backsplash. Hurray! Pictures to show my husband. He’ll be impressed!